I am traveling in Italy at the moment, and earlier this week I had an opportunity to visit the new Museum of the History of Bologna, which opened in January of this year. It’s housed in the former palace of the Pepoli family, and it’s part of a larger project, Genus Bononiae, initiated by the Carisbo Foundation to restore and link together eight cultural sites in Bologna. The Museum of the History of Bologna is a particularly interesting city museum for several reasons, one of which is that it’s a distinct departure from the “museo civico” model found in so many Italian cities. At some point I need to write a proper blog post about my experience there. But as is often the case when I visit for the first time a museum I really like, the seed of a new idea is planted in my head and I feel compelled to spend my post sharing that instead. 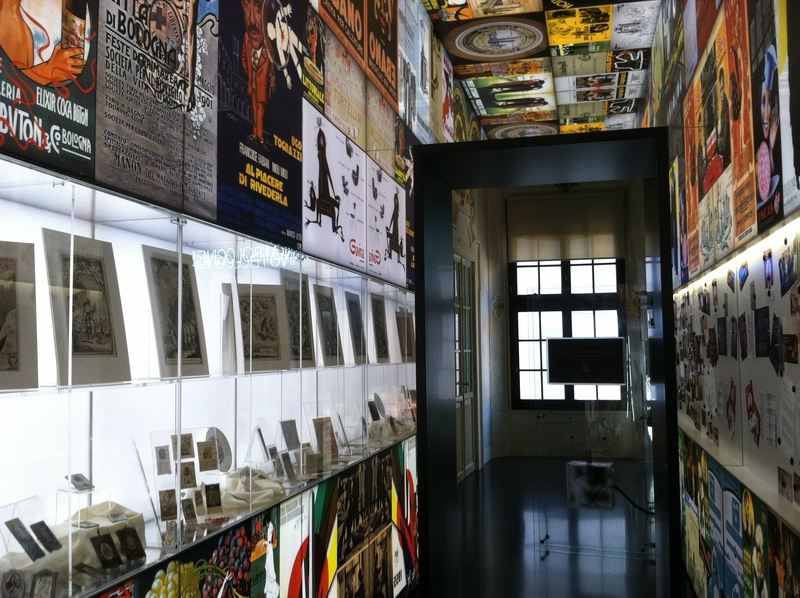 The idea I had in Bologna was sparked by a gallery at the city museum called “Your Museum” (pictured above). Its goal is to involve Bologna residents by inviting them to bring their own objects to be exhibited in the museum. Massimo Negri, the museum’s scientific director (i.e. chief content developer), told me he had originally hoped this gallery would be much bigger, with a system where people could bring in their objects and on the spot have them added to the display. Unfortunately, due to space and logistical constraints, he had to settle for the iteration I saw. Can a city museum catalog the material life of its city without actually acquiring and owning it? Imagine a zoo that collects animals from the wild and puts them together in cages. Currently, our museums are like zoos. Now imagine a biologist who tracks and studies animals, but never takes them out of the wild. We have sophisticated RFID tags and we have extensive object database software. Why not conduct a material culture census, or inventory, of a city, but not actually collect anything? This may seem like a lot of work for nothing. I would have said that too five years ago, but the museum landscape has changed enough that I think we could start to see the potential. There are so many opportunities here for public participation. Residents can catalog their own objects, with or without the help of a curator. People can “like” the objects they are particularly drawn to, or contribute additional information about objects posted by other people. Curators can put out a call for certain gaps in the “collection” that need to be filled. But perhaps also a resident can recommend that her neighbor’s object be added to the collection because it has a great story. And perhaps if an object gets many, many likes, it is then recommended for physical acquisition by the museum (subject to the owner’s approval, of course), a kind of crowdsourced method of determining which artifacts are most important to preserve, combined with some gentle community pressure for public ownership of them. Individuals could also recommend a neighbor’s object for exhibition at the museum, and so on. The role of the museum curator, then, is to highlight really interesting objects, monitor and improve accuracy, draw connections, and start conversations. Because, as you know, I am obsessed with geotagging objects, I think it would be great to have a mapping component where you can see all these objects existing out in real space, out in “the wild,” across the city. Although that may present a security risk that could serve as a deterrent to community members. If people know you have special things in your home then maybe they want to steal them. (And who knows what other practical considerations this idea raises since I’m really just thinking it off the top of my head.) On the other hand, many objects no longer live in the place where they had the most geographic meaning, so the tags on the map don’t necessarily have to represent current location, just location of meaning. Also, it would be easy enough to hide the identity of object owners so that only the museum has personal contact information. But wouldn’t it be interesting to see what happens when the material culture of a place is collectively exposed in this way, regardless of whether it is owned privately or publicly? Would it make us rethink what cultural heritage means, and perhaps assume a different kind of shared responsibility? I wonder if anyone out there has already experimented with this concept–if so chime in and let me know. Otherwise, let’s make it happen somewhere as a pilot project.